Working on perfecting some of my holiday recipes for Thanksgiving as well as my upcoming challenge! I whipped these bad Larryâ€™s upðŸ˜† just now and they are absolutely delicious!! 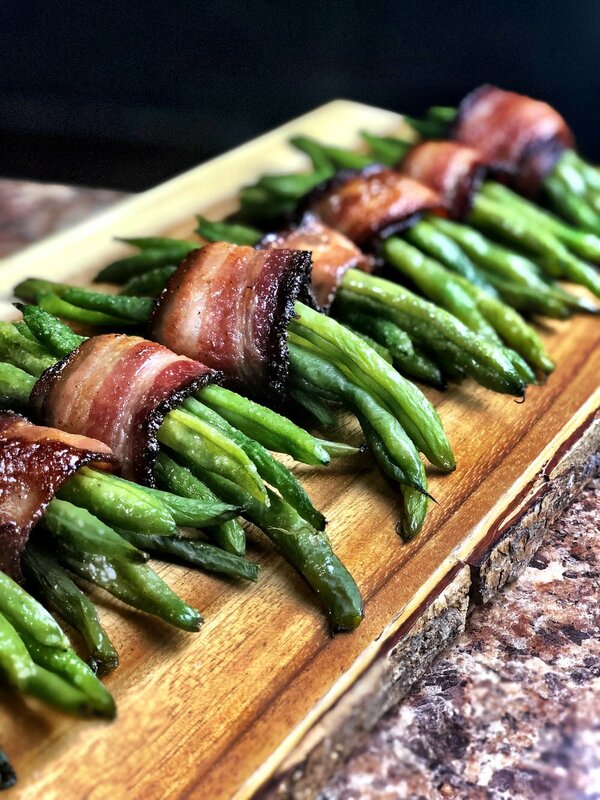 My Maple Bacon Green Bean Bundles are fantastic for and holiday meal or just because ðŸ¥“! Even the most in experiences cook could make these and have everyone asking for the recipe (they are super simple)! So give them a try! Heat oven to 400Â°F. Line a large, rimmed baking sheet with heavy foil. Lay bacon strips on pan without overlapping. Bake for 14 minutes or until bacon is just starting to brown on the edges while remaining underdone and pliable. Drain bacon on a plate lined with paper towels and let cool so you can handle them. Reduce oven temperature to 350Â°F. While bacon cools, boil a large pot of water. Blanch green beans by placing them into the boiling water for 3 minutes. Drain and immediately transfer beans to a large bowl of ice water so they will be cool enough to handle with your hands. Let sit for 1 min. Then drain the water. In the microwave , melt the butter. Mix in salt, garlic powder, cinnamon, syrup, cloves, and swerve until well blended. To assemble bundles, lay 10-12 beans in a pile . Take a half piece of bacon and wrap it around the top of the green bean bundle, tucking the ends underneath. Lay the bundle on a baking sheet with the bacon seam-side down. Repeat with all green beans. Using a basting brush or spoon, evenly spread the butter/syrup mixture over each green bean bundle. Season with freshly cracked black pepper, to taste. Roast at 350Â°F for 20 to 25 minutes or until bacon is crisp and cooked through. Allow to rest on the baking pan for 3 to 5 minutes before serving.